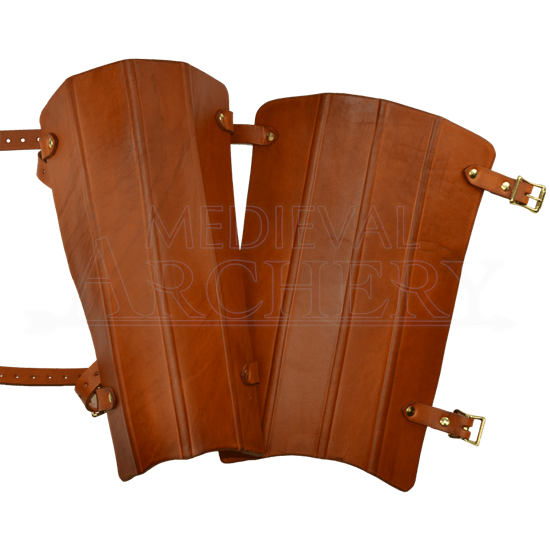 If you are looking for a pair of leather greaves that feature a little more character than a simple, plain leather plate that curves around your leg, but still want to avoid overt designs, then consider our Gothic Leather Greaves. These greaves, like our Simple Leather Greaves (DK5205), are made from high-quality, armor-grade 13/15 oz. leather that is ideally suited for use as armor, but instead of being a simple leather plate, it has been designed with ribs running vertically along the surface of the leather, adding a subtle touch of character to an otherwise plain leather plate. Rest assured that these greaves will perform just as well as their more plain cousins, but that instead of a plain plate, they offer a textured appearance that is simple but eye-catching. These greaves are worn by securing the two leather straps to their corresponding buckles at the top and bottom of the greave, and they fit nicely on the lower leg. These greaves also match nicely to several of our other leather armor items, so if you need more than just greaves, consider getting a matching set. If not, then at least you know that your legs are well-protected by a quality leather product, our Gothic Leather Greaves.